Home security systems are becoming the new central features that homeowners are aspiring to add to their properties. The reason? Security systems have become advanced and affordable all at once. Now, any homeowner can bring an all-in-one home security system into their household. While home security systems have become more and more popular, more and more options are coming to be available. Today, we are going to help weed through the many different security companies in order to focus on the work being done by the team at Bunker Hill Wireless Security Systems. We’ll be highlighting their top systems, what features prospective buyers can expect, and we’ll even outline which system we think trumps the rest. If our readers have spent any time looking over some of the alarming burglary statistics currently plaguing the United States of America, they’ll know just how important it is to shore up their home with a wireless security system. One of the top DIY home security system providers on the market right now is the team known as Bunker Hill Wireless Security. They’ve released a series of great DIY systems through the internet that varies in features based on the needs of their customer. Let’s take a look at their systems so we can know what to expect. According to statistics compiled by the Department of Justice, 88% of all burglaries are occurring at residential properties. Of these burglaries, 9 out of 10 will happen when the homeowner is not in the building. This means that a security system could be the only means of identifying the intruder. Weather Resistant Day/Night Vision Cameras, With Audio. While there are dozens of great Bunker Hill wireless security systems available, we decided to take a moment in order to highlight our favorite: the New Bunker Hill Wireless Surveillance System 62368. While the name isn’t catchy, the 62368 is a complete all-in-one wireless network that features 4 video channels, weather resistant cameras that have both night vision and day time recording, and an intuitive access screen. 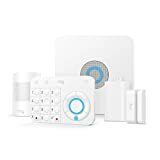 This system is sleek and easy to install so we can’t help but suggest it to people looking for their first home security system. At the end of the day, it is up to the proactive homeowner in order to protect their property and what they value inside of it. Fortunately, there are amazing and affordable home security solutions that can be acquired with the simple dial of a phone number. Protect America has been proudly servicing the home security industry since they opened their doors in 1992. Over the years, Protect America has established themselves as one of the top home security companies in the nation. Protect America believes in offering customers low rates on their home security packages combined with high-quality products. With free estimates and no installation fees, Protect America is on the cutting edge of home security innovation. Contact Protect America today in order to get a free quote and, perhaps, a plan for a security system package.